Add class and distinction to your backyard with this Pergola project that covers a corner of this homeowner's swimming pool! Could you imagine stepping out of your swimming pool, surrounded by hanging baskets and clinging vines? The "Smith" Project by Leisure Select offers a great looking pergola spanning any space you can imagine; this homeowner (see picture) needed a pergola over a section of their swimming pool! Add a custom pergola to your outdoor space and we promise guests and neighbors will be impressed. Do you like the idea of a pergola, but are scared it will not match your home's exterior? This pergola can be completely customized to your tastes and needs, so pick between styles, colors and sizes to match your home. A great extra add-on to any outdoor space, a pergola acts like an Outdoor Room, giving you space to entertain or decorate with hanging plants, wind chimes and other accessories. It's time for a great custom pergola to fit that odd and boring space! 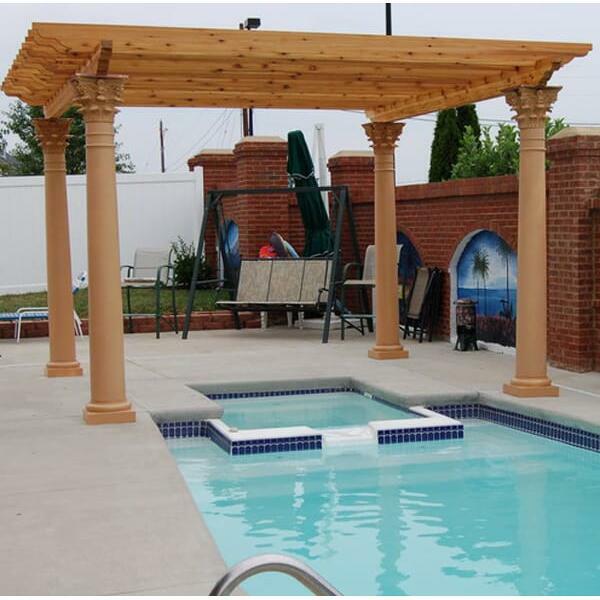 Contact us today and ask about the "Smith" Pergola Project by Leisure Select!